What Is the Difference Between Omni-Channel Marketing and Single-Channel Marketing? When marketers use single-channel marketing strategies, they tend to focus your business on a single means of reaching your customers. With omni-channel marketing, on the other hand, you interact with a specific target audience using direct marketing channels. Organizations wanting to make the most of their marketing efforts must explore the option of a single-channel marketing approach, such as direct mail, vs. an integrated marketing techniques, which combine direct mail, social media and cross device digital marketing. Whether the goal is to increase business sales or, in the case of some non-profit organizations, simply to find the most effective way to communicate messages to the right audiences, it’s important to establish which method gives you the best ROI. Single-channel marketing is preferred by many marketers because of the presumed lower costs of marketing via a single channel such as direct mail. It is often assumed that it is quicker to execute a single-channel marketing campaign than it is a omni-channel marketing campaign. Some proponents of traditional marketing techniques still believe that, once you dominate the market with your offering through single-channel marketing like direct mail, you’re bound to retain that position of dominance. The downside to taking the single-channel approach to your direct marketing, particularly for businesses and non-profit organizations whose operations rely heavily on the success of the response rates and conversions, is no longer effective enough with the rise of the digital age. Customers today are consuming media across several different channels and marketing in just one runs the risk of missing your ideal targets altogether. Internet-based marketing is firmly established as the new frontier as far as getting the most out of advertising and marketing initiatives by individuals, corporations, and non-profit organizations alike. The majority of consumers are connected to the web in one form or another through different devices such as desktop computers, smartphones, and electronic tablets. In fact, it can be argued that more people today find content delivered through these channels much more captivating than the traditional leaflet. It is therefore in the interests of organizations that want to fully further their reach and propel their brand footprint beyond the traditional spheres to explore the possibilities. Propelo Media is a leading company that maximizes social and digital media to bring integrated marketing campaigns to dominance and enhance conventional direct mail campaigns. Our approach is to make your direct mail marketing go further by layering it with 6-7 additional impressions across social and digital marketing. Propelo Media takes your target audience and appends records to find social media handles, email address and cross device id’s to match to the mailing list and then run cohesive, yet platform-adjusted ads, to be delivered at the same time your mail hits homes. They have consistently been able to boost organizations’ direct mail ROI through this social media and cross device integrations. This is done by significantly raising the level of engagement as customers have contact with more impressions than provided through a single-channel approach, consequently capitalizing on the double persuasive nature of integrated marketing to boost response rates. Having a successful omni-channel marketing campaign depends on an organization’s ability hold a single and cohesive view of the audience across all the relevant channels the audience is already listening to. Customers want to have a consistent experience across these different channels. That’s why it’s imperative to work with an experienced marketing company such as us, who are experts at integrating direct mail marketing with online digital and cross device advertising. What’s great is that the ads on social media and mobile devices cannot be skipped and are not spam filtered. By using omni-channel marketing, you can expect a rise in response rates compared to when you use single-dimensional or non-integrated marketing approaches. The success of any campaign depends on the effectiveness of the attempts to communicate to audiences with the intent to evoke responsive action. Businesses and even non-profit organizations should consider omni-channel marketing for the simple reason that it presents the biggest opportunity as far as getting your messages in front of your targeted audience. By combining direct mail and social media such as Facebook marketing, you can increase your chances of gaining interest and interaction from audiences. 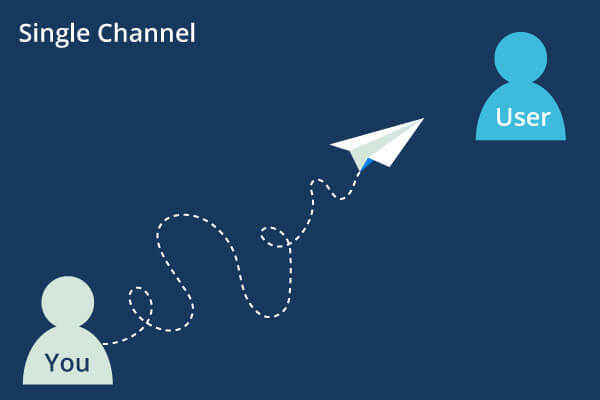 It is also important to note that omni-channel customers spend more than single-channel customers do, which is traditionally offset by increased campaign performance, as much as 37% increase. Taking direct mail marketing a step further by incorporating responsive designs or prospect-targeting with social & cross-device advertising makes your marketing, and your brand, stand out among the others and a significant advantage presented by an integrated marketing campaign. The services are, in fact, designed to work together and build upon one another. Experts in integrated marketing campaigns can help you create a platform for omni-channel marketing with strategic targeting, good campaign management, advanced analytics, and proper execution including marketing mix optimization and response attribution analysis. An omni-channel marketing platform will allow you to integrate traditional and more recently established channels, taking advantage of the power of social and digital media. Some of the important things to remember are to always view the customer in a single way so that you have brand and message consistency. Creating consistent customer experiences across all channels is also a crucial element of integrated marketing success. This is the secret to most successful direct mail campaigns that have managed to take advantage of the power in combining the traditional marketing approach with social and digital marketing to make the most impact.